The Sigma 17-70 f2.8-4 DC Macro OS HSM C Canon is a “standard” zoom lens for APS-C cameras, in this case Canon. It is also available for Nikon and Sigma APS-C bodies. It covers the range 17mm to 70mm, the relative focal length for full frame 35mm would be 27.2mm to 112mm. This type of lens is aimed at photographers looking for a single, all purpose lens that will at the same time be compact enough to carry around. This particular lens is also equipped with a Macro setting allowing focussing down to 22cm giving a reproduction ratio of 1:2.9. The design is of 16 elements in 14 groups, two of the elements are FLD (with characteristics similar to flourite glass) and one is SLD (Special Low Dispersion glass). It is optimised for use with digital capture, as one would expect for an APS-C lens and is equipped with optical stabilisation (OS), a hyper-sonic motor (HSM) for autofocus and a 7 bladed iris giving a round aperture. The diameter is 79mm, the length 82mm and the weight is 470g Sigma has recently introduced categories for its lenses, A for Art lenses, S for Sport lenses and C for Contemporary lenses. This 17-70 is the first offering in the Contemporary category, the design characteristics of which are ‘Superior optical performance and compactness”. The construction of the lens includes “Thermally Stable Composite” (TSC) material for increased durability and reduction in weight. Sigma does not explain exactly what this material is but it has the benefits of polycarbonate components, but avoids their thermal expansion. The Sigma 17-70mm has a DxO Mark Score of 15. This makes it the 5th best APS-C zoom lens tested on the Canon EOS 7D. However if you look at the scores in detail, for sharpness it ranks number 3, ahead of any canon APS-C lens. This does exclude all of the immensely good lenses designed to cover full frame 35mm but they generally have a price tag to match the larger format. The score of 15 overall and of 9 P-Mpix for sharpness makes this a very serious contender. Distortion and vignetting at 0.4% and 0.7EV are at the lower end of the range of scores in this group, transmission differs from the stated value by just under 0.5EV which is on a par with other lenses of this type and chromatic aberration is well controlled, better than most. Sigma 17-70 f2.8-4 DC Macro OS HSM C Canon vs Canon EF-S 17-85 f4-5.6 IS USM vs Tamron 17-50 f2.8 Di II XR VC Asph IF Canon. The Canon is the cheapest of this group and the Tamron the costliest. The Tamron also has the shortest zoom range, just under 3x while the Sigma has 4.11x and the Canon 5x. The Tamron has the widest aperture, fixed at f2.8 throughout the range, which for lower light working will be a big bonus. On the face of Sharpness the Tamron looks good: 10P-Mpix is just higher than the Sigma. Both the independent lenses beat the Canon which scores just 7P-Mpix. Tamron lens does do very well, but it is far less consistant: at its best it just beats the other two but wide open it has to be at 50mm to win and stopped down it really falls apart. The Sigma on the other hand maintains a similar result throughout the range of focal lengths and does better at retaining quality stopped down. The first point is that the Canon is not as good. It’s slower by a full stop over the Sigma and it lacks the sharpness of the other two. The Tamron will probably produce the nicest results at its optimum aperture and focal length but the Sigma will come close and just beats the Tamron overall. Additionally the Sigma is cheaper, lighter by 100g, zooms out to 70mm instead of 50mm and offers a greater degree of magnification for Macro: 1:2.9 against the Tamron’s 1:4.8. It is good to see when companies introduce an updated version of an existing product and it shows a real improvement. Sigma has had a 17-70mm macro zoom lens in its range since 2006. Initially it had no image stabilisation and the AF was not Hyper-Sonic, but physically it looked very like the new version. Version two had the IS and HSM but was quite a bit heavier. The progress in quality has been good, P-Mpix has risen by one point each time and the overall score has climbed two point each time. The original version had less distortion than the subsequent models but the distortion is really not a serious issue with this lens anyway. A final brief comparison with the Flagship ‘standard’ APS-C zoom lenses from Nikon and Canon, admittedly these are really marketed to a different sector but the figures are quite sobering. Both companies produce f2.8 lenses with a 17-55mm range, both have a price tag twice that of the Sigma, both are much heavier and larger (quite understandably given their faster aperture). However the Sigma from a quality point of view is as good as the Canon and better than the Nikkor. If it is not essential to have the fixed f2.8 aperture then the Sigma lens is really the best value here. This chart showing chromatic aberration shows that the Sigma is just as good as the much costlier Canon and both are better than the Nikkor. At some point or another nearly every photographer is going to own a ‘standard’ zoom lens. If their camera has an APS-C sensor then it is going to be something like a 17 or 18mm to 55 or 85mm. This Sigma 17-70mm is right in the middle of this range, but that is the only place where it is in the middle. In all other respects it is among the front runners. 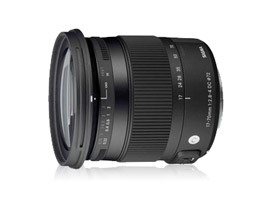 Of its type the Sigma 17-70 f2.8-4 DC Macro OS HSM C Canon is well priced, well specified and a good performer.